After twice failing the entrance exam to train as a naval officer, Édouard Manet (1832–83) went to Paris to pursue a career in the arts. By the late 1860s he was one of the most celebrated artists in the city. 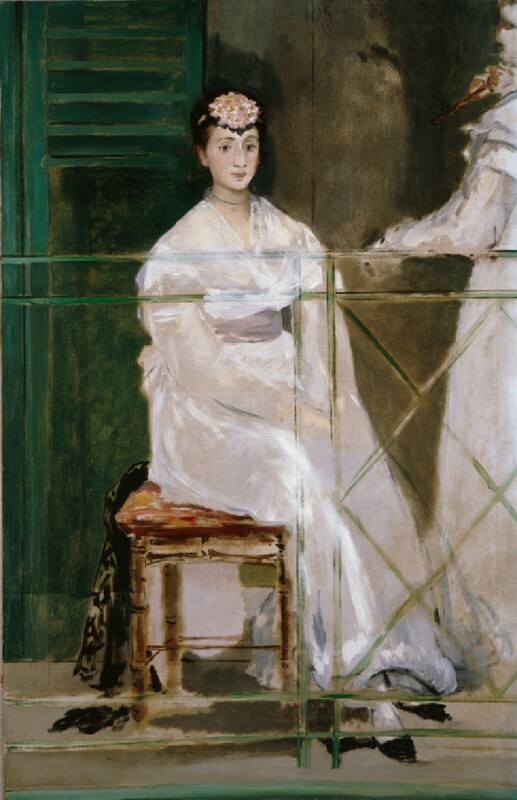 Manet was restlessly experimental, and by the late 1860s he was moving away from his personal interpretation of history painting towards subject pictures incorporating portraits of his friends and relations. During the winter of 1868–9 Manet worked on Le Balcon (‘The Balcony’ now in the Musée d’Orsay, Paris). In his Paris studio, Manet asked a number of friends to pose for him. Fanny Claus (1846–77) was the best friend of his wife, Susanne Leenhoff. A talented violinist, Mademoiselle Claus married the artist Pierre Prins (1838–1913) in 1869. The other figure in the painting is Berthe Morisot (1841–95), another of Suzanne Leenhoff’s close friends. As was his usual practice, Manet began his composition by painting directly onto the canvas, without making preparatory studies. His first idea of the picture included only two figures, Berthe Morisot standing on the right and Fanny Claus seated on the left. While working on the painting, Manet decided to revise the composition completely. He took up a new canvas which was eventually completed and exhibited as Le Balcon. The first picture was bought by the American artist, John Singer Sargent, and at his death passed to the family of his sister from whose descendants it was acquired by the Ashmolean.